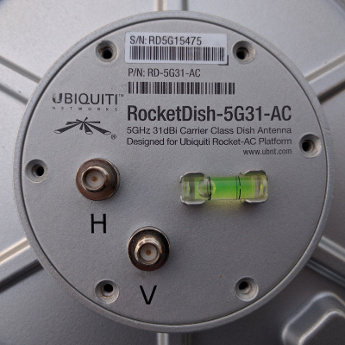 Ubiquiti RocketDish 5G31-AC is a dual-polarization 5.1-5.8 GHz antenna with gain specified as 31 dBi. 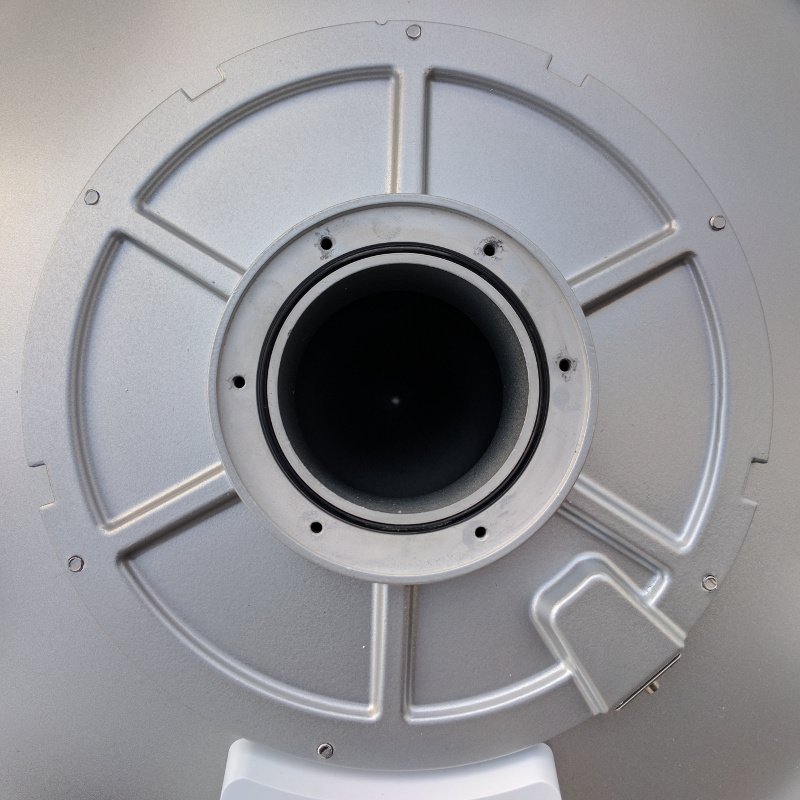 It features a deep dish construction of 75 cm diameter for much better side and back lobe rejection. 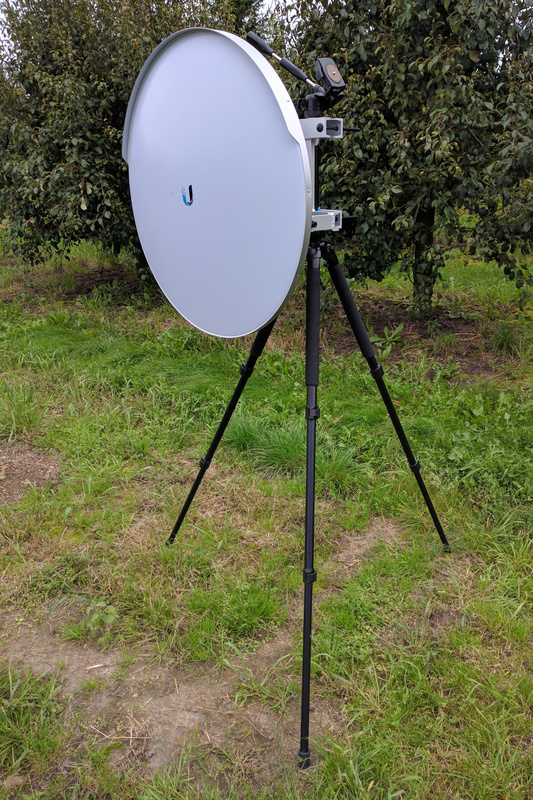 In comparison to other dish antennas, this one is pretty light-weight at just 7.6 kg, including mount and radome. 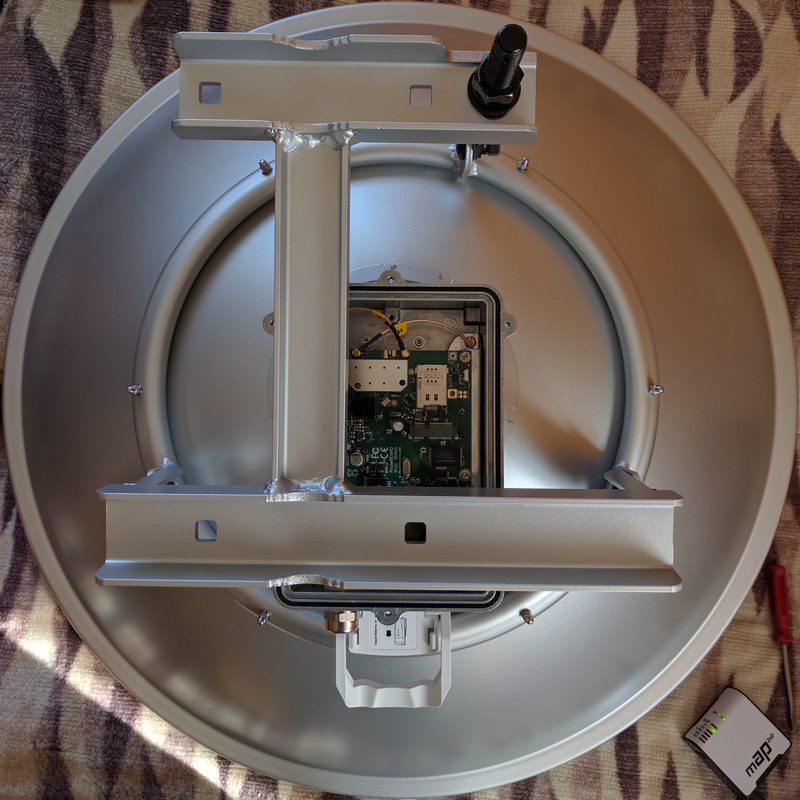 I bought it in September 2017 for Wi-Fi DX-ing. At first sight, the production quality is quite questionable. 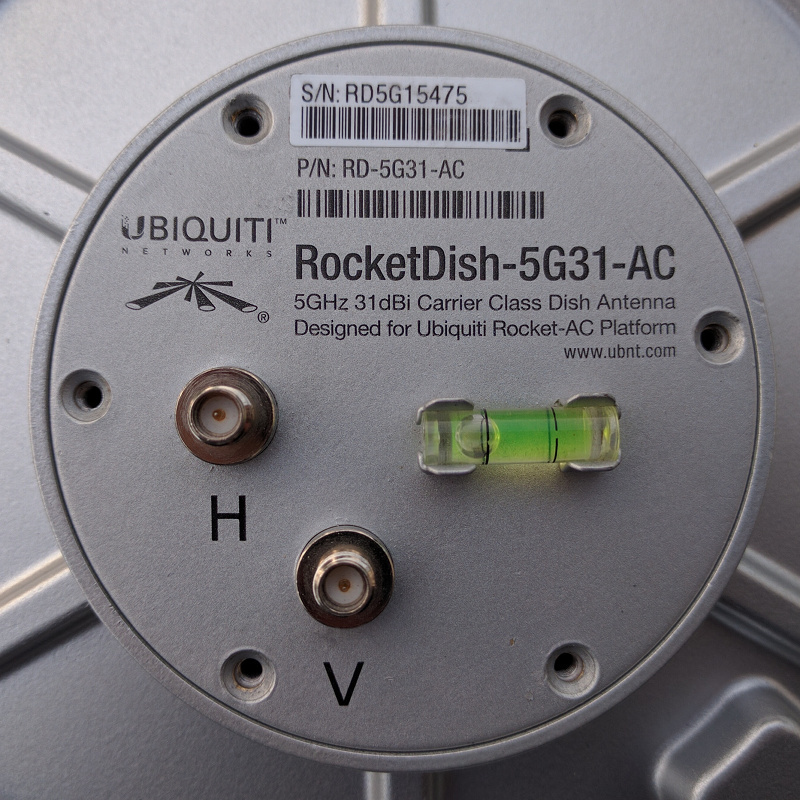 The UBNT logo is somewhat misaligned and the top hood is asymmetrically positioned. 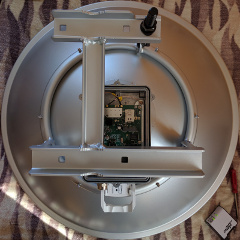 I did not remove the protective radome, as it is mounted with rivets. However, there is a video on the YouTube of the dish internals. Two RP-SMA connectors are placed at the rear panel, together with a bubble level indicator. 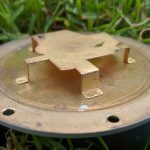 The driven element can be easily disassembled from the whole dish and it actually consists of one piece of conductor combined for both horizontal and vertical polarization. 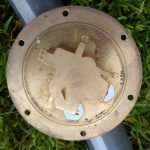 Its quality is also puzzling – one can see lots of scratches, some dark spots and even discontinuities of the coating. Note this is a brand new unit. Fortunately, the performance seems to be fine. I measured VSWR up to 1.7 within 5.1-5.8 GHz frequency range using Agilent N5242A network analyzer. There is a plastic socket behind the dish, dedicated for Ubiquiti Rocket radio. 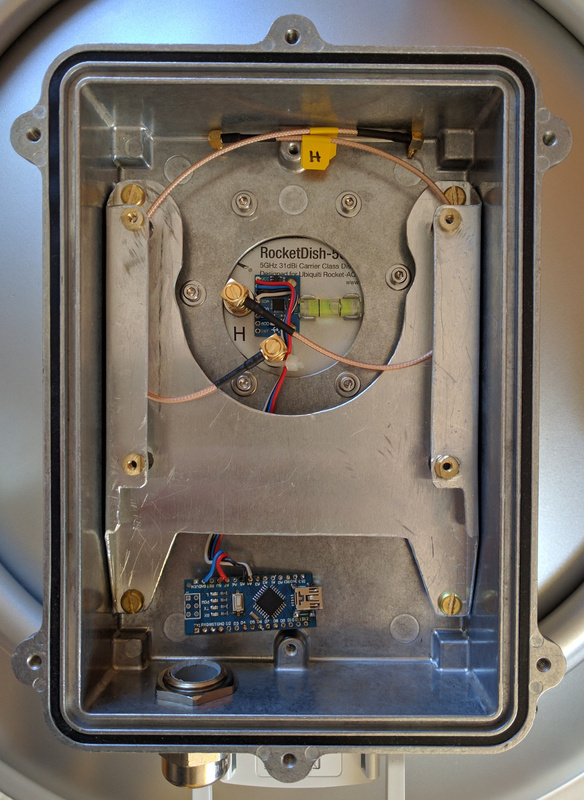 Because I’m MikroTik hardware user, I had to make a custom box for RB912UAG-5HPnD board. 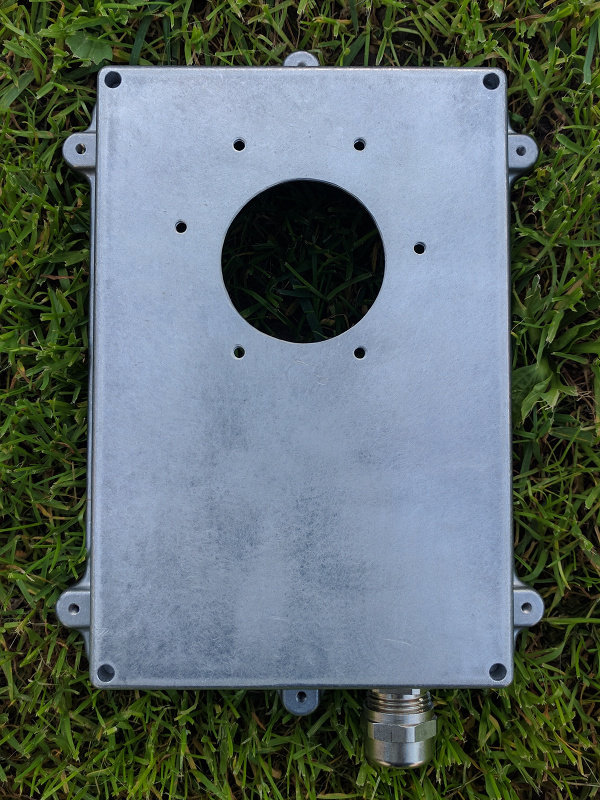 I bought an aluminium IP67 enclosure Gainta HQ029S. It required a lot of additional work though. 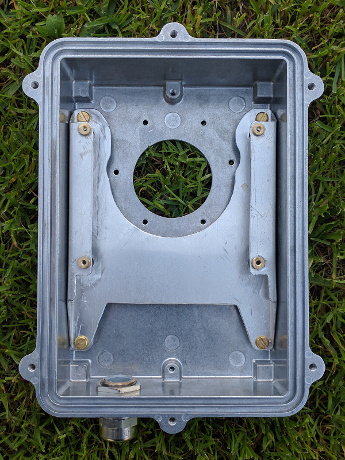 Apart from drilling holes for bolts, mounting cable gland and cutting out space for antenna’s rear panel, a special holder for the PCB was also required. The antenna’s rear panel with RF connectors was installed back together with my custom enclosure. 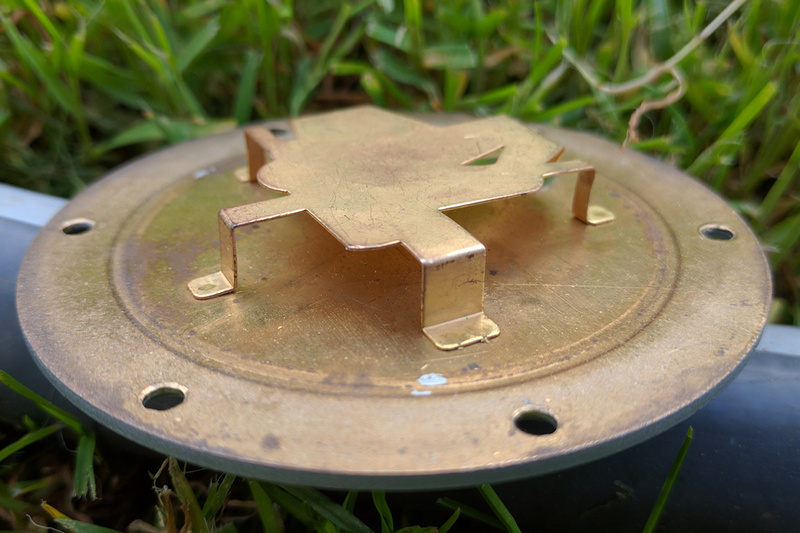 I also glued an accelerometer module for antenna elevation angle measurement, connected to Arduino clone. 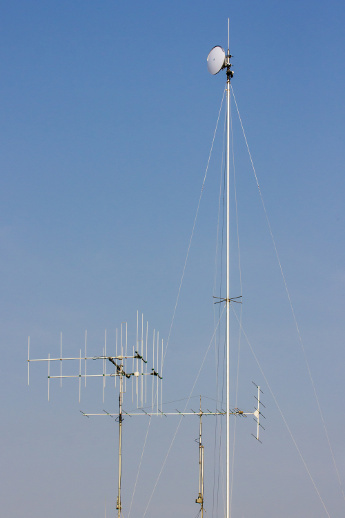 It is not reliable as an absolute indicator though, but helps with mast leveling using guy lines. By the way, I can upgrade the program on the Arduino board at any time. Of course MikroTik RouterOS does not support that, but I prepared a build of OpenWRT (LEDE) with avrdude which can be booted via Ethernet. 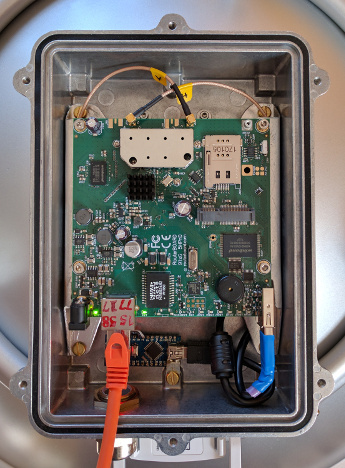 The RB912 has a 2×2 MIMO 802.11an radio (AR9342 chipset). 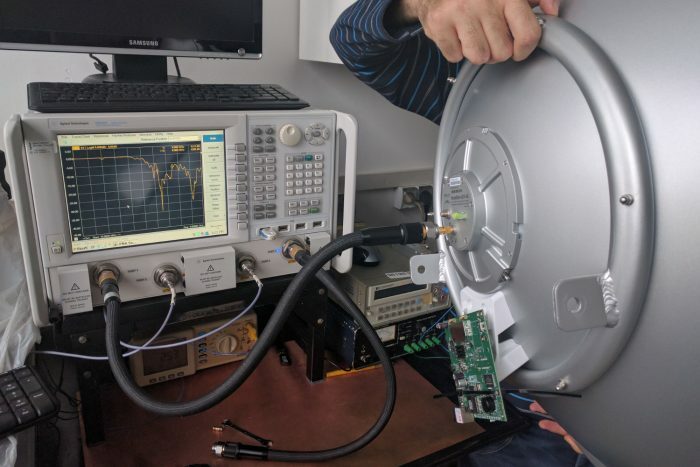 Unfortunately, it is unreliable for Wi-Fi DX-ing, as channel calibration takes over 100 ms. During that time, all reported signals values are underestimated and the sensitivity is considerably worse. 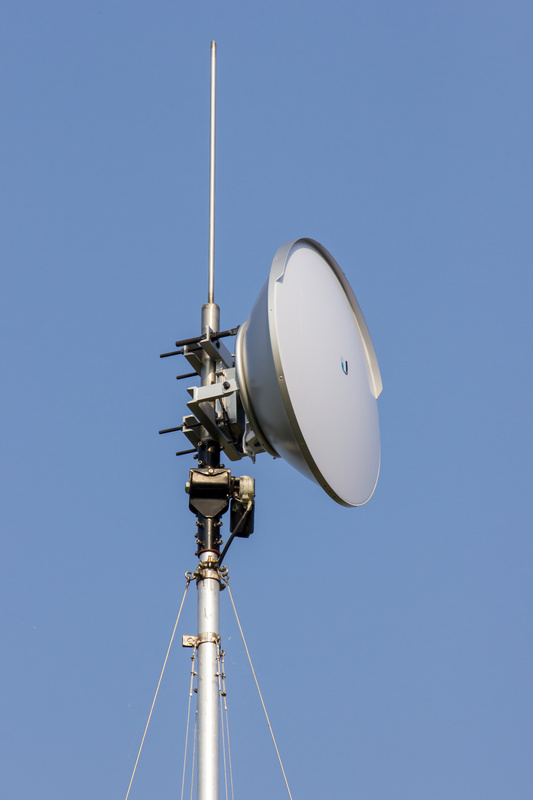 The workaround is to use long channel time (at least 200 ms/freq, preferably more). 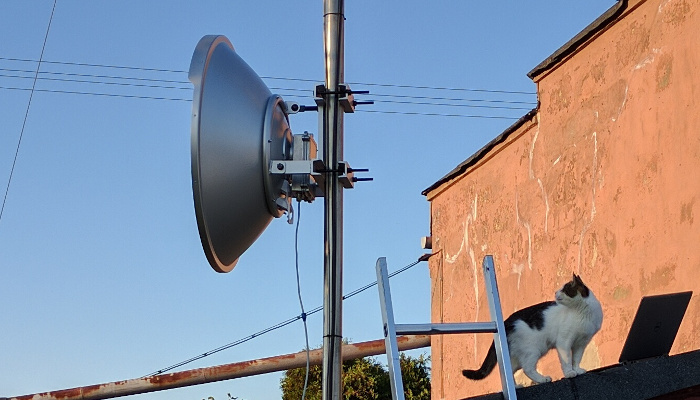 This problem has been reported to MikroTik, but with no result. 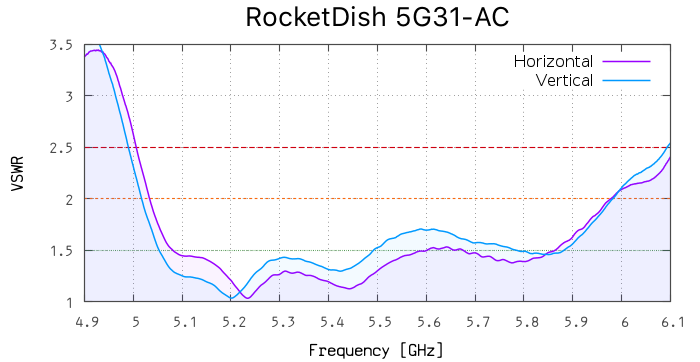 On the other hand, hardware with older AR92xx chipsets allows to sweep the whole band at 2× faster rate (100 ms/freq). 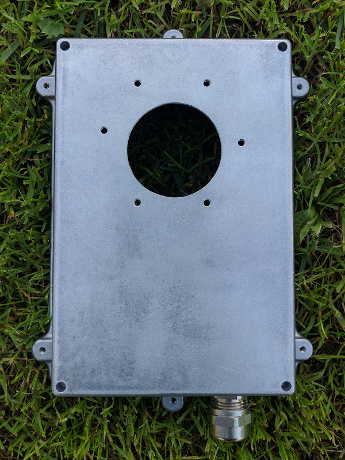 The sealing between my custom enclosure and antenna’s rear panel is done with a rubber gasket. 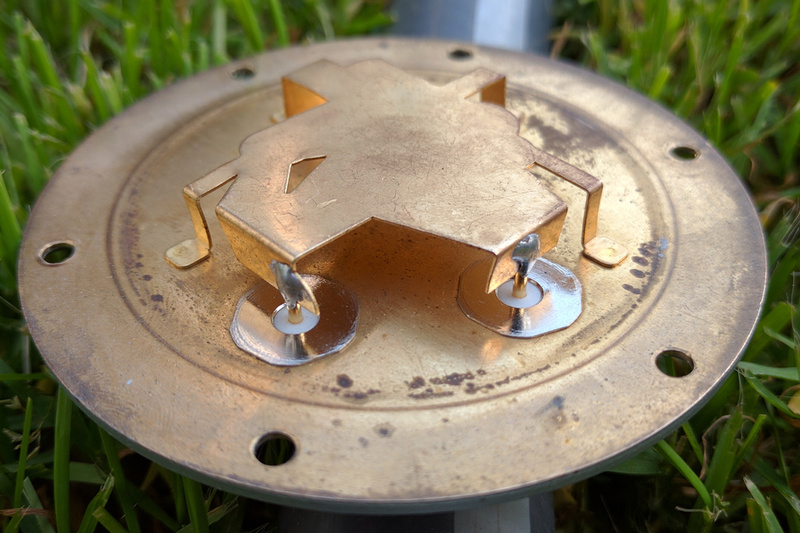 I did some preliminary tests of the antenna before erecting it up on a huge mast. The antenna mount seems to be made of aluminium (or maybe actually duraluminum), as it is very light-weight. 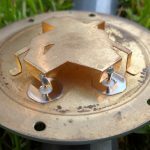 Separate elevation rod is also an awesome thing to have, as the antenna can be reinstalled on another mast without additional alignment. 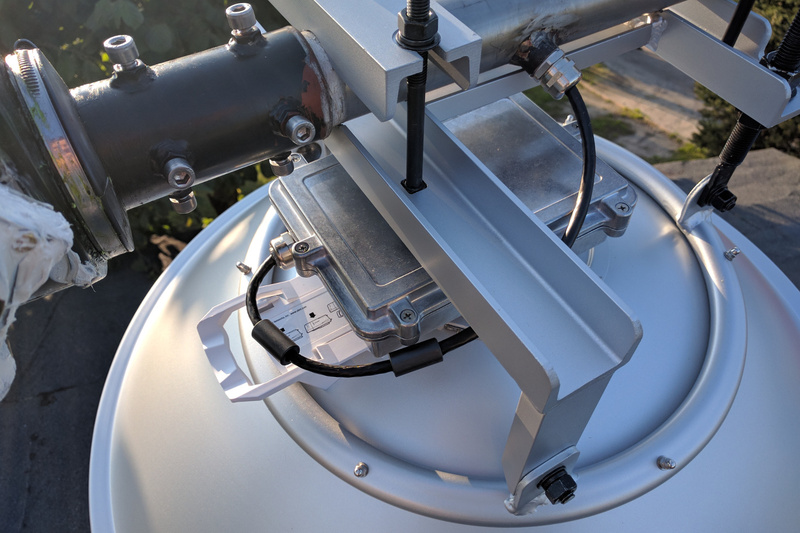 There is enough space between antenna mount and the box to open it up, so the board can be replaced after installation on the mast without any further disassembly. 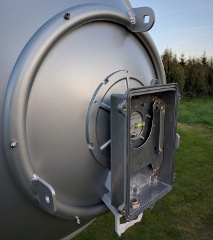 There are some things to consider and test, like polarization separation. 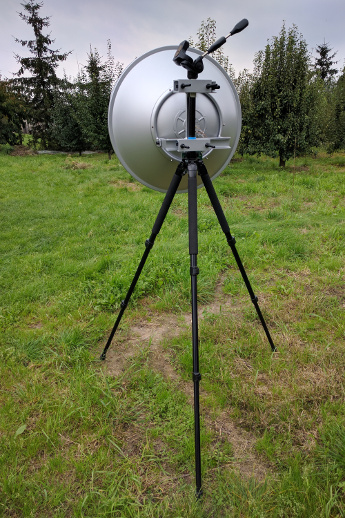 However, according to my preliminary tests, it doesn’t look too well… I also have an idea how to measure the radiation pattern using high rate packet generator and signal level averaging. However I need to find a good place with full line of sight and reasonable distance from my antenna. questionable build quality for such price. 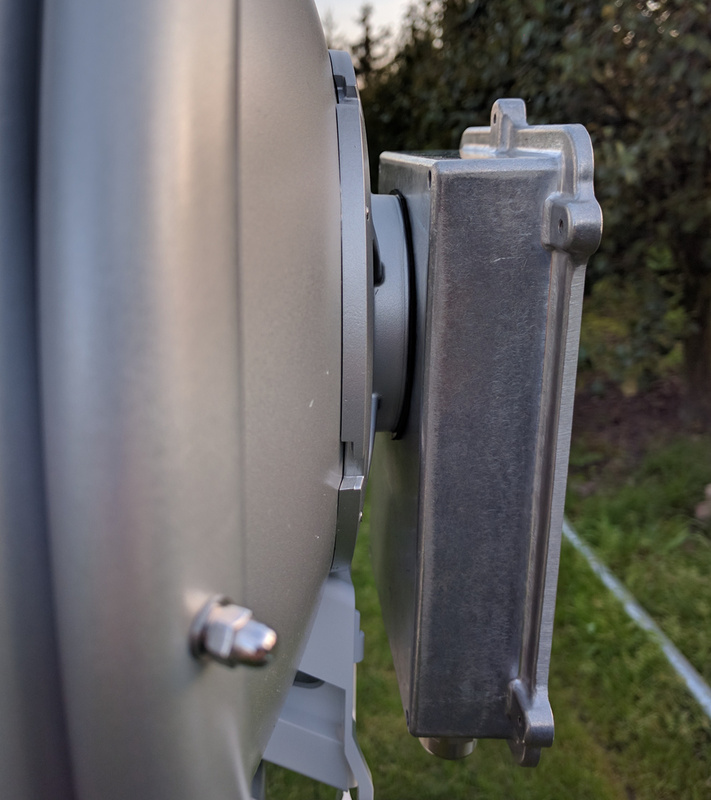 The antenna is now installed with a rotator, at the top of a 18 meter aluminium mast (80×5 mm + 70×5 mm + 60×5 mm + 50×5 mm) and can be remotely controlled from anywhere. 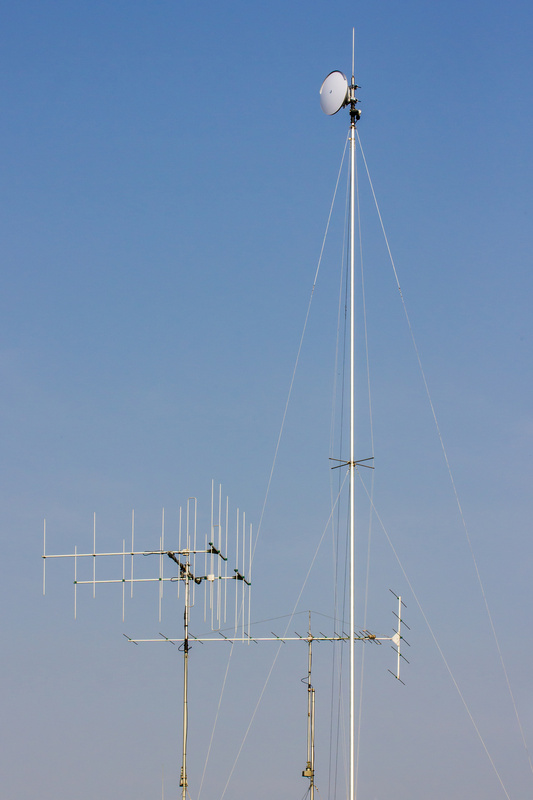 The following video presents the erection of the mast, done using three manual winches. What about Wi-Fi DX results? My personal distance record is approx. 464 km.